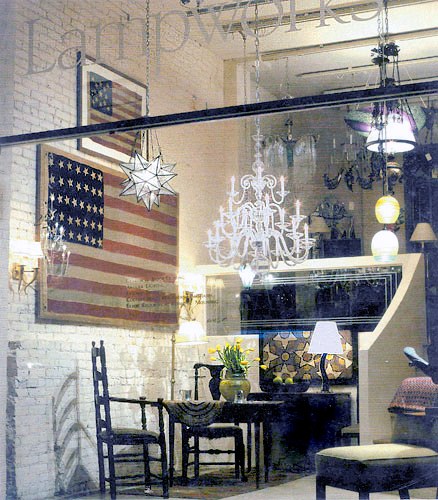 Donald Hill’s window was planned as a Patriotic Salute for President’s Day. Along with antique American fixtures, a Flemish-style hand-blown three-tier version of the “Casper” chandelier, and brass sconces, Donald included antique American furnishings and accessories from his personal collection. Hand-woven rugs, rare museum-quality early US flags, and 16th century tavern furniture are among pieces that create a warm, inviting atmosphere. Among Donald Hill’s clients are celebrities in the film and television business.